The Koattakha River runs through the small village of Paspota, in the Jessore district, supporting around 50 households along its banks. The general livelihood activities of men in the village are fishing, agricultural day labor, and small-scale business, while women are mainly housewives and occasionally keep livestock. U.S. 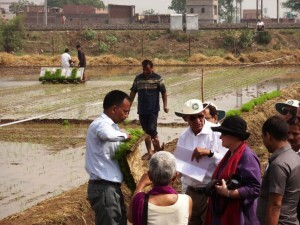 Ambassador to India Nancy J. Powell visited the experimental site of the Cereal Systems Initiative for South Asia (CSISA), Sabajpura, at ICAR Research Complex for Eastern Region (RCER) – Patna, on 13 May, 2013. Ambassador Powell interacted with scientists from CSISA and ICAR, Subject Matter Specialists (SMS) of State Agriculture Department, women farmers of Muzaffarpur and Samastipur districts and service providers from Bhojpur, Begusarai and Buxar districts of Bihar. Ambassador Powell said that the U.S.-India partnership has been based on the joint commitment to improve agriculture productivity and climate resilience, and increase farm profits. She also commented on how the success of CSISA has set an example of the United States and India working side-by-side, and making a positive difference in people’s lives. Various resource-conserving farm technologies were demonstrated at the ICAR-RCER Sabajpura farm. These technologies included mechanical transplanting of rice, laser land leveling and direct seeding of rice. Dr. R.K. Malik, Co-ordinator, Eastern UP & Bihar, explained the technologies being demonstrated at the site and its impact in helping farmers improve their productivity. Earlier, Dr. B.P. Bhatt, Director, ICAR-RCER, and Dr. Andrew McDonald, Country Representative, CSISA, explained the role played by CSISA in developing and extending the best management practices under conservation agriculture in Bihar. The CSISA project is jointly funded by the U.S. Agency for International Development and the Bill and Melinda Gates Foundation. It supports efforts to improve cereal production growth in Bihar, Uttar Pradesh, and Orissa. Such efforts utilize improved cropping systems, better management of natural resources, development of new cereal varieties and hybrids, and increased public and private investments in markets.